Jackmannii looks smashing! It's been a great year for Clematis, must be all that rain. I don't sneer at your Stella. I believe there are no banal plants, only banal uses of them. Stella is a victim of abuse and overuse, but it's still a nice plant. I hope your dogs sent the rabbit family packing. Aha, now I know what that yellow plant is that I'm seeing everywhere around here but have never noticed before - yellow loosestrife! Thanks for posting it! :-) Love your clematis - it certainly is doing well and definitely is worthy of showing on GBBD. Love the clematis! 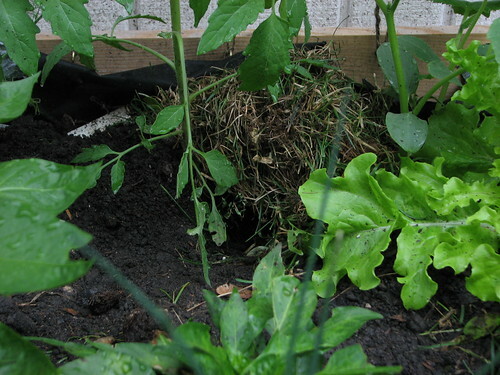 I hope for the sake of your lettuces the rabbits get chased out. Awesome clemantis Diane! Stella is wonderful in my book. We have happy returns here. Both bloom so prolifically and are so easy-care, it's no wonder they're welcomed into so many gardens. Stella is great for problem areas. I have more than I know what to do with right now, though. I just moments ago found our bunny nest. We get one every year somewhere in the yard. Last year it was in my lettuce patch! And I even had the patch fenced off. 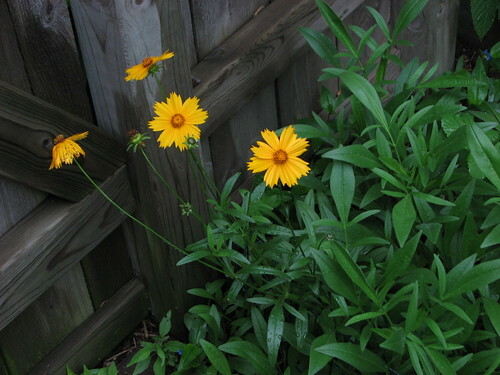 This year it is next to my tarragon. I like good ole dependable Stella - she goes with everything. 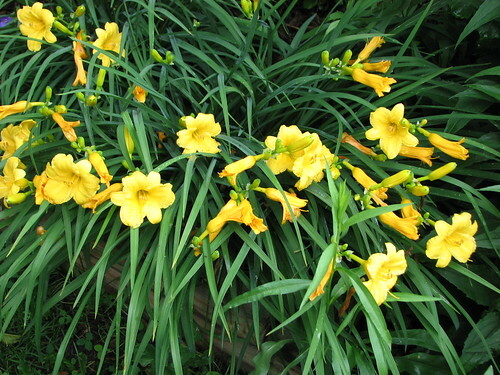 Of course, I like yellow flowers in general, so that's a plus for her. Your clematis is beautiful - one day mine will have that many blooms (I hope). Glad you posted your Jackmanni--he's stunning! 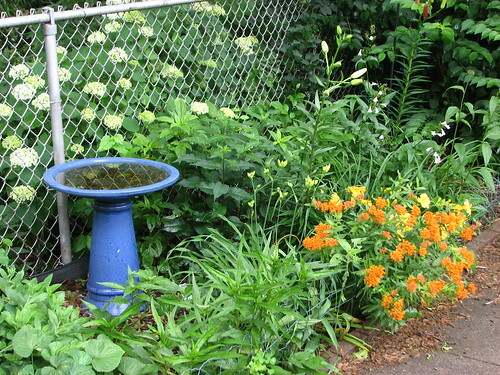 I'm not one of those who sneers at Stella--she provides lots of bright color in my garden, too. You've got to love a plant that's so hardy and dependable year after year. 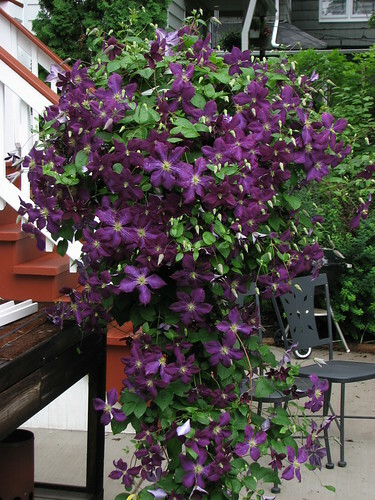 Amazing clematis!!! Very cool... I also love your alice pic off to the side. 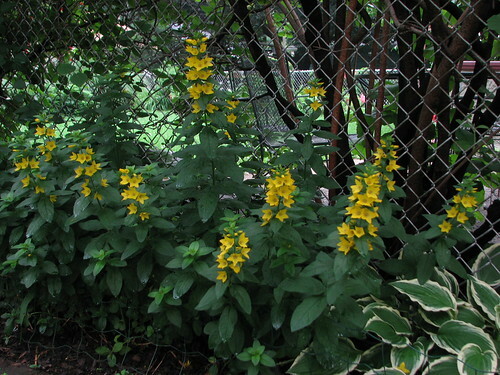 I also have a plant I call yellow loosestrife, but it has dark foliage and smaller yellow flowers. I'll have to look it up what Lysimachia it is... that the trouble with common names; there are often different variations and if you know the Latin name, you just know for sure!